2019 Yard Waste Season begins Monday April 1st!!! There’s a new choice in town! Service will be delayed by one day all week. Service will be delayed by one day starting Thursday. Thursday and Friday service will be delayed by one day. Service will be delayed by one day starting Wednesday. Don't spend more money than you have to on garbage! We started Suburban Waste Services to bring back the local full service hauler to hometown communities like Carver, Chanhassen, Chaska, Cologne, Eden Prairie, Edina, Minnetonka, Plymouth, Savage, Shakopee, Prior Lake, Victoria, & Waconia. We have over 19 years experience in the waste industry and, like you, we care about our local communities. None of the garbage we collect ends up in landfills. Instead, it is processed into energy at a resource recovery facility. We offer great value and personal service and because we believe in community service, SWS proudly works with and is active in local community organizations. Please support your hometown hauler and sign-up today! Help support a local Eden Prairie company that gives back to the community. Suburban Waste Services is a local, hometown garbage hauler servicing Carver, Chanhassen, Chaska, Cologne, Eden Prairie, Edina, Minnetonka, Plymouth, Savage, Shakopee, Prior Lake, Victoria, & Waconia MN. SWS provides weekly residential waste service, weekly yard waste service from April through November, bi-weekly no-sort recycling with a 68 gallon cart (in Carver, Chanhassen, Chaska, Cologne, Eden Prairie, Savage, Shakopee, Prior Lake, Victoria, & Waconia), and one-time bulk pickups. 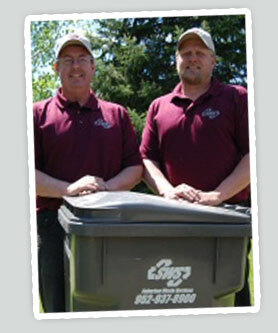 "We just moved to Eden prairie and are so pleased to have Suburban Waste Services. Our new house had some rotting fence, and so we called SWS to see if it could be removed. Derek and Val came in like heroes and took it away!! Thanks so much- you guys are fantastic!!!!" - Helena K.
"I just wanted to send in a letter complimenting some of your drivers on their excellent service. I live south of Shakopee but work construction throughout the metro. I see a lot garbage service trucks driving way too fast and leaving the cans in disarray once they leave. Not so with the guys on my route. I see them driving at a sensible speed and lining up the containers in a perfect line once they leave. Last year I had a broken wheel on one of the containers and was meaning to call in to have it replaced. Before I could get a chance a new one was delivered to my house. Then recently on a Friday I had forgotten to take my container down to the street. To my surprise, Jesse, our driver walked up to get it on his own. It may seem like trivial matters to most. But I do appreciate seeing people who take pride in their work. Thanks for the great service."